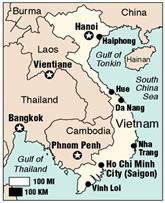 On April 30, 1975 the Vietnam War ended and the exodus of the Vietnamese people from their homeland began. Members of the Tran-Tien Family were part of that exodus. But wherever they resettled in the world, be it the United States, Europe or Australia, their hearts and minds are always with their homeland and the people left behind, especially those of Minh Huong village. Located along the Perfume River, this village, about eight kilometers north-east of Hue City, was the initial resettlement of Tran-Tien ancestors who fled war torn China in the late 16th century. It is where several subsequent generations of Tran-Tien raised their families and helped the community by practicing herbal medicine and acupuncture. In 2005 the Tran-Tien Family held a reunion in Hue and visited their birthplace, Minh Huong village. They realized that people in the village were living in extreme poverty and lacked proper medical care. High blood pressure and diabetes were neglected. Disabilities due to traffic, work and other accidents did not receive proper attention. Birth defects such as cleft lip-palate and other congenital conditions of the extremities were common, but were not a priority for the Vietnamese health care system. Surgical treatment from charitable foreign teams often overlooked this small community. To address these issues, descendents of the Tran-Tien Family, under the leadership of Dr Sum Tien Tran and his relatives (Khanh T. Tran, PhD and Ngac T. Tran, MD) decided to establish the TranTien Foundation Inc. to carry out the family tradition of contributing to the community and taking care of the less fortunate by providing medical and social services at a local walk-in free medical clinic. In 2007, recognizing pressing needs of patients for reconstructive surgery, The TranTien Foundation organized the first fact finding trip and a seven-day-surgery program with a voluntary team consisting of three doctors (Sum Tran- plastic surgeon, Ngac Tran- family practicioner and Yen Nguyen-anesthesiologist). In collaboration with the City Hospital and Central Hospital in Hue City this team performed needed surgical treatments on 28 patients (out of 67 patients that were pre-selected by the local clinic) The patients presented different problems (from facial clefts to burn scar contractures) and the procedures performed were diverse (from hand reconstruction to micro-surgery); but the results were significant: these patients were able to rebuild their lives as productive citizens. However there existed many more patients who needed reconstructive surgery. The majority of these patients had complicated problems and had suffered for a long time without treatment due to poverty and lack of medical care. Local surgeons do not have the specific and updated training in reconstructive surgery to perform needed procedures. A training component with seminars and workshops, was, therefore, added to the program. To meet the needs of the poor and disadvantaged families of Minh Huong, the Trantien Family had the idea since the beginning to establish a pre-school to provide early education to children age 3 to 5 before they enter the official public elementary schools .Usually they are left at home in the care of grandparents or older siblings while parents are working in the fields or at the markets. After a year of raising fund and construction of the building, the first scholar class did open in 2010.